Some of you may be wondering, "Who is Gertrude Baines? An actress? Singer? An all around cutie pie?" Well... no. 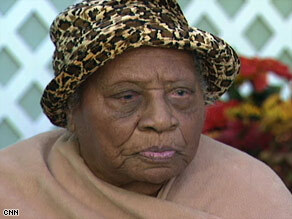 She is likely to be the oldest person in the world in a few days at 114 years old. Like... she was born to slaves, son. No joke. Her parents were former slaves. The beautiful this is, she lived long enough to see America elect its first Black president. Not only did she witness it, she partook in the election, voting for Obama because "he's for the colored people." You know what... she gets honorary cutie pie status. Keep on doin' your thing Gertrude! I'm sure you're not going for a "cute" blog here, but this post definitely has the cuteness factor. What an amazing life!